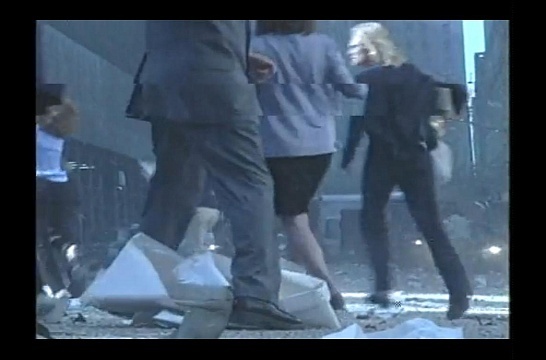 The entire pool of 9/11 imagery was crafted by the planners of the 9/11 hoax. 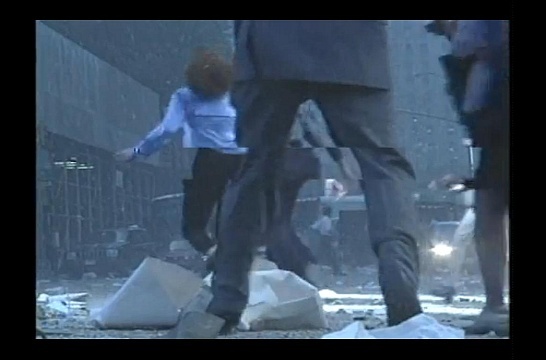 The TV imagery was, as demonstrated, entirely computer-generated - i.e. entirely fake. 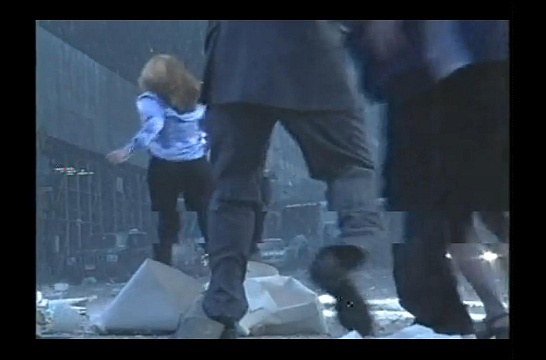 And so was ALSO the so-called "amateur" footage and pictures released later on. 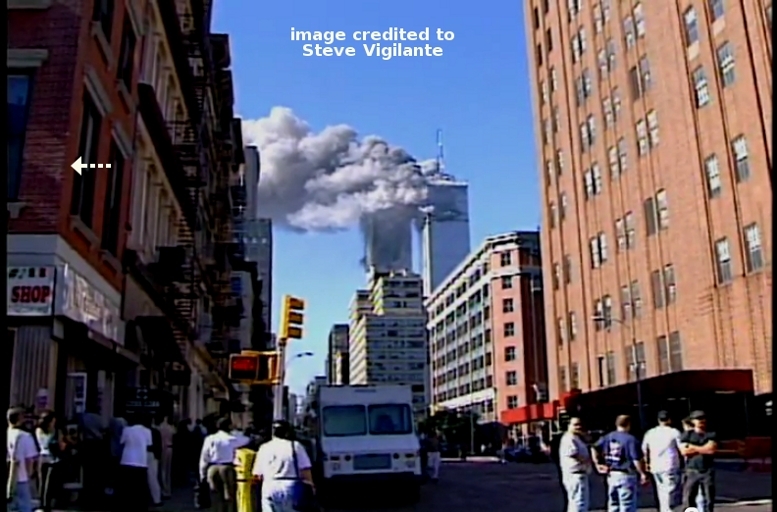 I personally suspect a man called Steven Rosenbaum - and his "CAMERA PLANET company" to have manufactured most - if not all - of the 9/11 "amateur" videos. More about Mr. Rosenbaum here. Did you notice those doves flying by ? - and see if you can capture sharp, sequential frames such as these on film. Good luck! 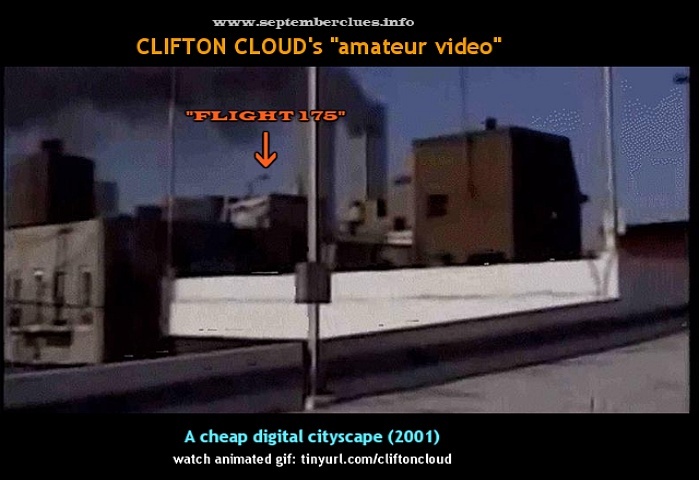 Next, let's have a look at this 2001 video frame credited to "Mr. Clifton Cloud", who allegedly captured the crashing "FLIGHT 175" from a Manhattan rooftop. Today, a 15-year-old can tell this is cheap computer imagery - not a real cityscape. Here's the infamous closeup shot credited to "EVAN FAIRBANKS". 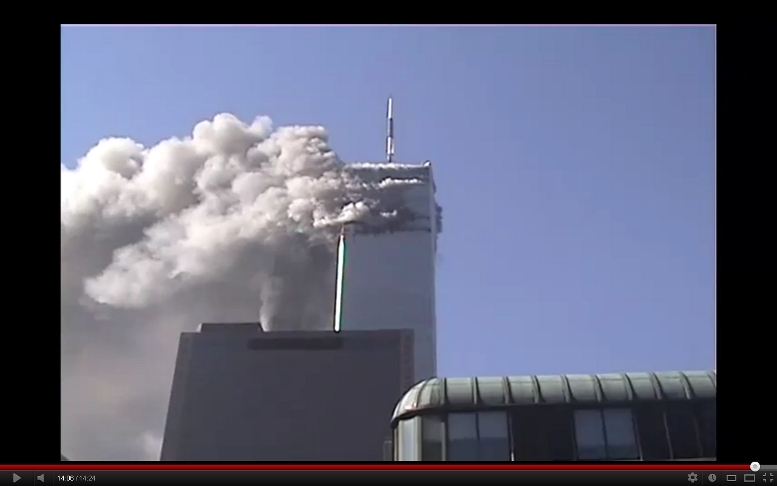 Not a splinter of the 'aircraft' shears off as it hits the WTC! 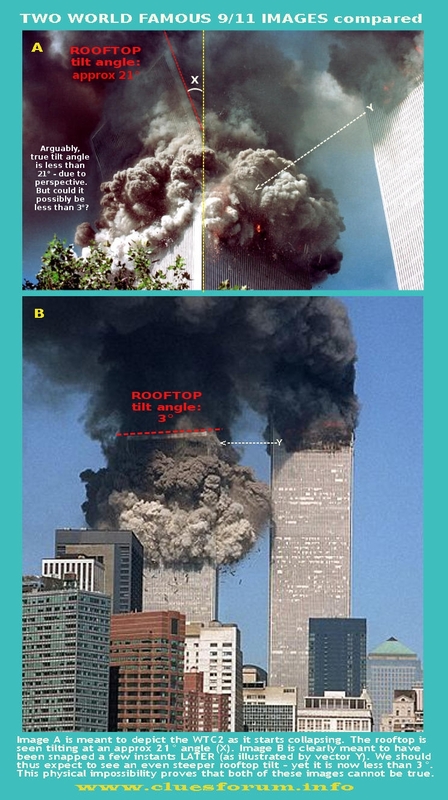 The general quality/resolution of this new, 2010 NIST/FOIA imagery was significantly superior to any previously available 9/11 imagery - something which no observant, experienced 9/11 researcher failed to notice. This was, clearly, a case of history repeating itself - and immediately brought to mind the ridiculously crisp & glossy Apollo imagery which emerged out of the blue, decades after NASA's phony moon landings. 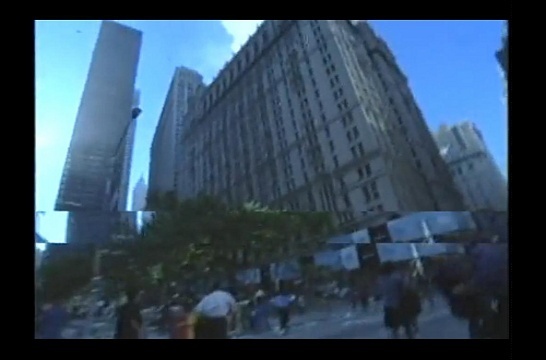 Evidently, these new 9/11 video clips were nothing but an upgraded batch of re-polished, re-hashed and re-processed "3D" computer renderings. 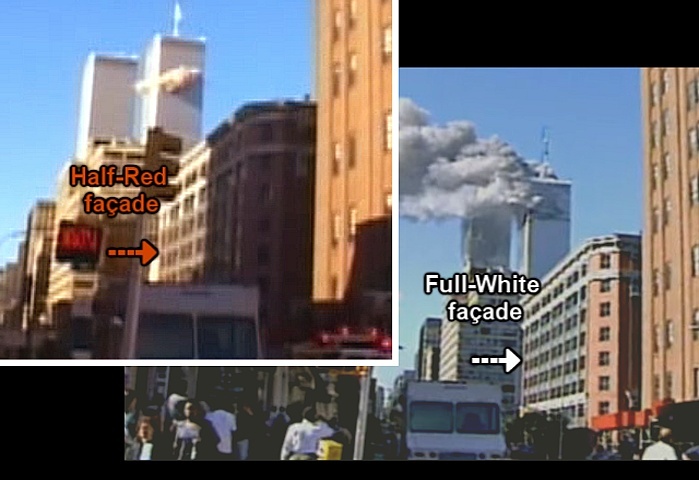 Luckily, the higher resolution of these clips actually helps us detect and highlight in even more compelling manner the phony nature of the 9/11 imagery. Here I have looped the "Huibregtse" video between 0:58 and 1:09. We have a zoom-out motion followed by a zoom-in motion. 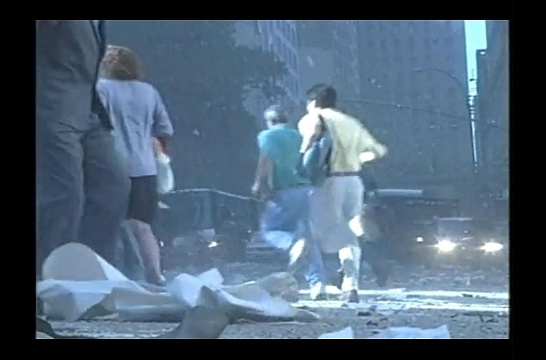 Focus your eyes on the top of WTC7 (the building seen emerging at bottom of screen). Watch how it's height appears to grow during the zoom-out motion - yet remains rock static during the zoom-in motion. You just can't have it both ways. Not in the real world. Speaking of the real world - since when does charcoal black jet fuel smoke turn chalk white - in the matter of seconds? 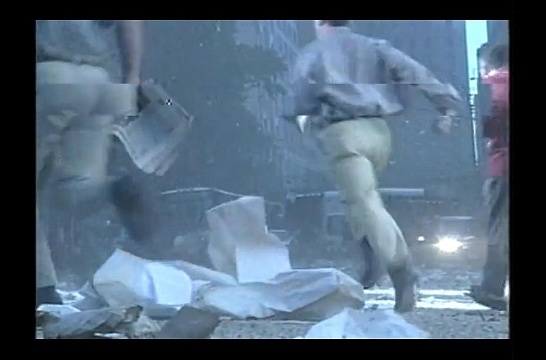 But the best part of "Jim Huibregtse's" clip is when it shows a supposed 'suicide jumper' (which we shall call "ISAAC") tumbling down the tower façade - causing poor Sir Isaac Newton to, once again, spin in his grave. ISAAC's trajectory can be traced in three easy steps: A - B - C.
And here is ISAAC's full trajectory. My red line represents how a body - attracted by Earth's gravity - would fall on a perfectly windless day. 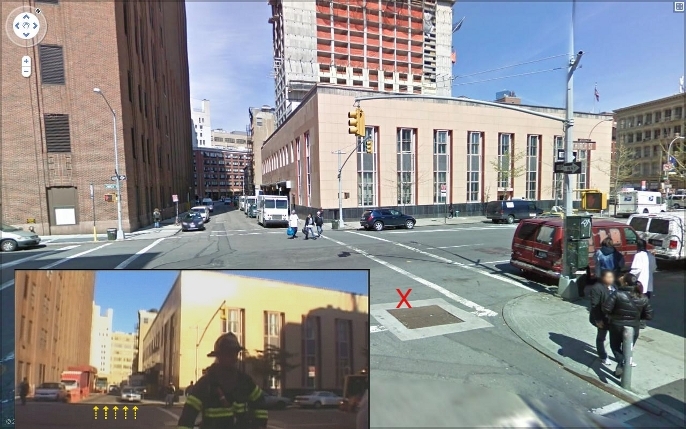 Thanks to the WTC's vertical beams (and knowing that there were 59 of them for a total tower-width of 208 feet) we can compute ISAAC's sideways-drift speed in this 5-sec long shot. Please check the maths for yourself if you will : I get an approximate figure of 10 ft per second - or 6,81 mph. So, you may ask: "what was the average wind speed on 9/11?" 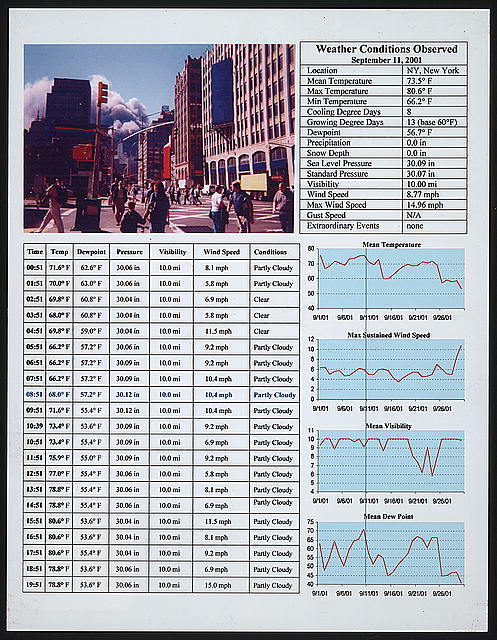 According to this weather chart (see below), the recorded wind speeds of those early morning hours fluctuated between a minimum of 6,9mph and a maximum of 10,4mph. No need to be a rocket scientist to know that a free-falling human body won't drift sideways at a rate of 7mph ... due to a 10mph breeze! It just won't happen- in the real world. We ain't kites, you know ! Watch ISAAC's shadow parting from himself ! Also, Can anyone provide rational / convincing answers to these 5 questions? 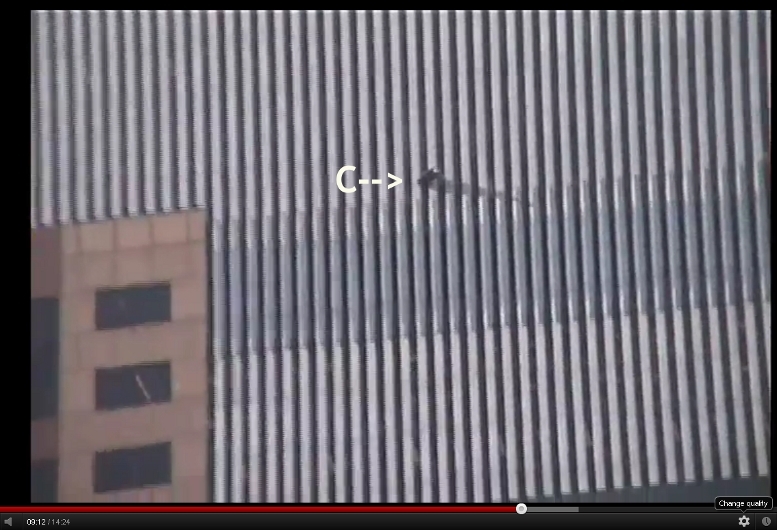 1: The window washer machine on top of WTC2 (at left) is nowhere to be seen in ANY of the other existing 9/11 imagery. 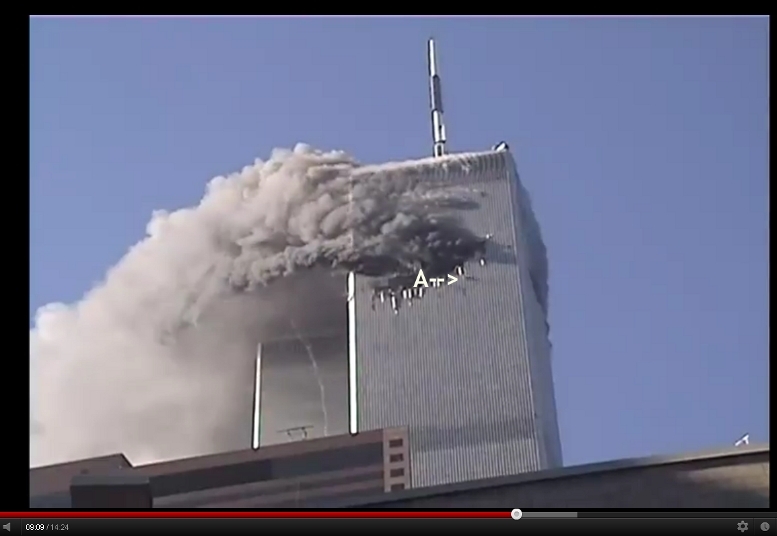 2: What is this smoke puffing out of the top floors of WTC1 - only 3,5 seconds after the "FLIGHT11 strike" ??? 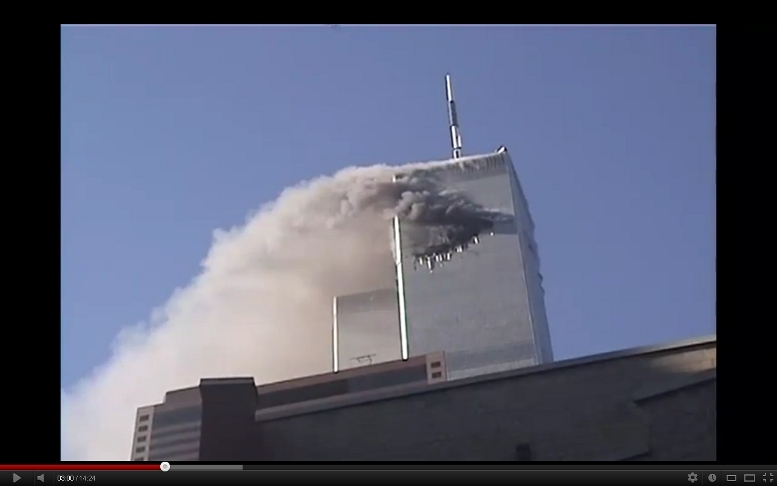 3: What is this fireball exiting the South side of WTC1 - WAY below the level of "FLIGHT11's" entry hole? 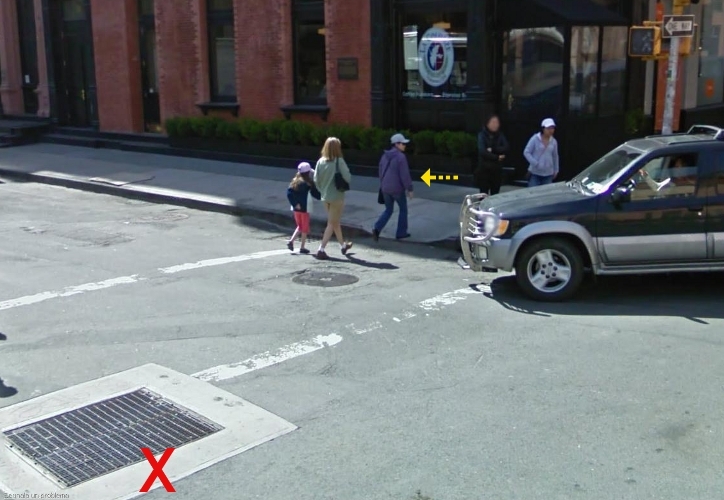 4: Why can't we see the right wing's gash /entry hole - which successively becomes clearly visible? 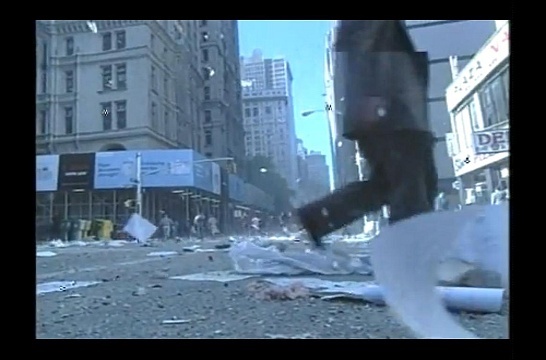 5: What explosive forces could possibly have caused that puff of smoke emerging out of the West side of WTC1? if this were the case, you would not have only HALF the building in chromatic conflict with the other. 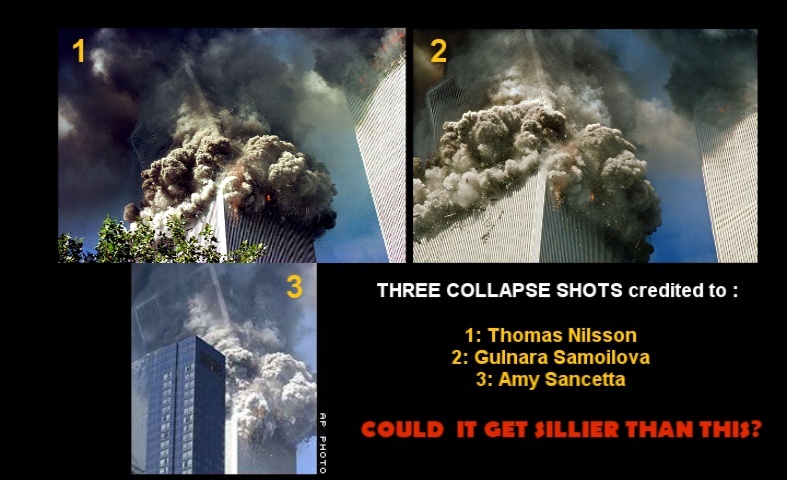 Of course, the simple fact that someone releases on Youtube in 2010 a "never-seen-before" 9/11 video supposedly shot from a virtually identical angle as the Naudet brothers is outrageously stupid. 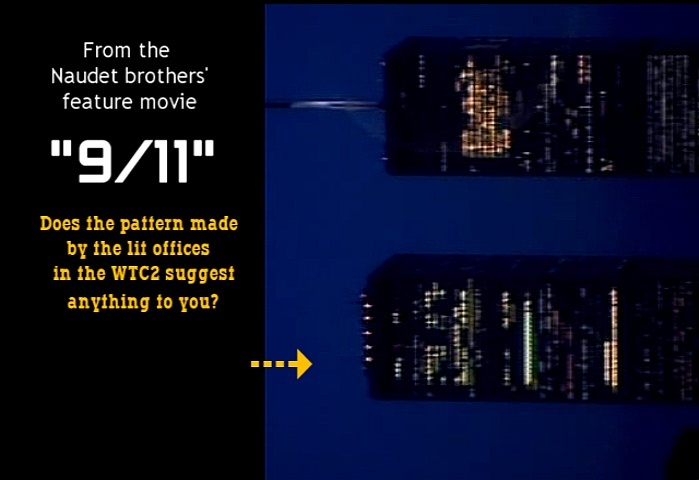 Do you really think it is just coincidental that the Naudet brothers captured a night shot of the WTC towers PRIOR TO 9/11 - with the office lights spelling out a "9/11" pattern ? Can you really believe that this was just pure, coincidental happenstance? If you can, there is very little I can do to help you exit the 9/11 Matrix. Good luck to you and your life on this planet. Perhaps ignoring these facts will make your life a happier one! "BOTH of these images cannot be true." STEVE ROSENBAUM is now a 'curator' at the National 9/11 Museum & Memorial ! 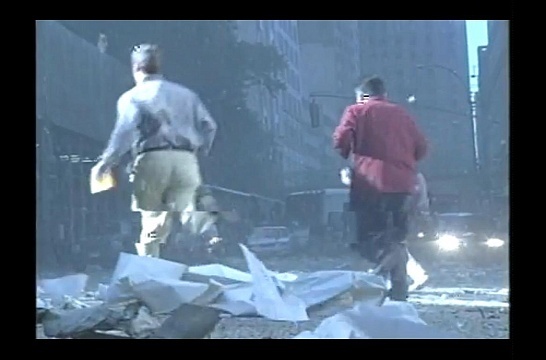 MORE "AMATEUR IMAGES OF FLIGHT 175"
Wow. The perps just keep churning out more and more variants of their old "FLIGHT 175" templates. Two brand new "amateur still pictures" have recently emerged (credited to "John Sullivan" and "Jane Barrer") - but they are clearly only slight variations of the old "Sean Adair" shot (as featured in September Clues). Why I have never seen these fabulous, Pulitzer-worthy shots by Mr. Sullivan and Mrs. Barrer until today is quite a ...ehrm... 'mystery' to me! 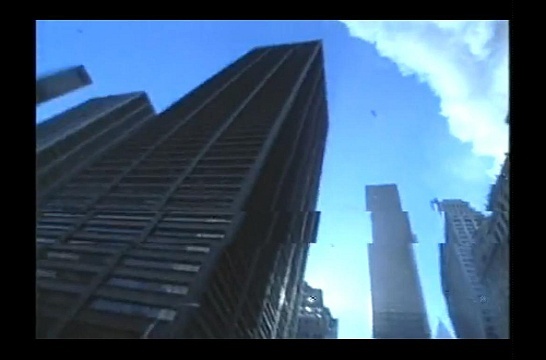 But of course, you are all free to believe that Sean Adair, John Sullivan and Jane Barrer JUST HAPPENED TO COINCIDENTALLY CAPTURE this 550mph airliner - ONE second or so before it struck WTC2 - from slightly different vantage points! Here's another sequential series of glitches. 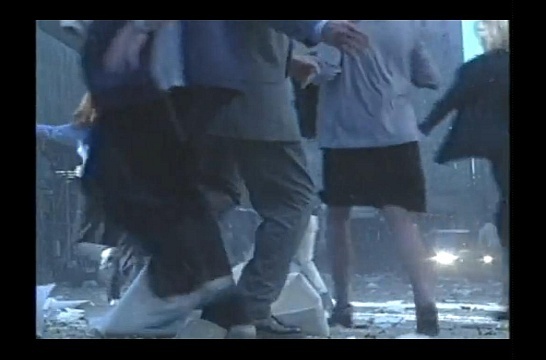 The last frame at bottom right features a man in yellow shirt 'losing' his lower leg only (no 'videotape-tracking' involved whatsoever): this rules out any tentative counter-arguments suggesting that these glitches are any sort of standard video artifacts caused by tape tracking/misalignment issues. 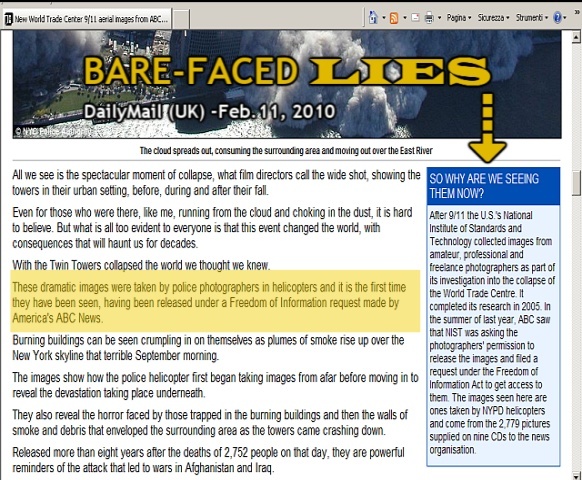 Undeniably, the difficulty of exposing the fraudulent 9/11 imagery pool and its digitally animated graphics resides in the fact that it was most likely produced with non-consumer softwares; as we are left unable to compare the bugs and flaws of those softwares with any known image-processing tools, we can only speculate as to the origin of the observable aberrations. 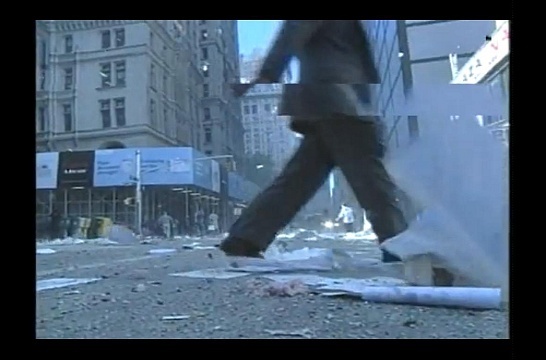 Conversely, the uniqueness of these aberrations represent the most compelling evidence that something is very wrong with the proposed images of 9/11.